Yet for me, after former Alaska Gov. Sarah Palin’s defense of Dr. Laura during the “n-word” controversy and Glenn Beck’s feigned gratitude to “divine providence” for picking the Aug. 28 date, it just seems historically improper for most black conservatives to acquiesce to the spirit of this event, particularly as some of the principal personalities involved have long sidestepped the crisis in black America today — the very issues that King spoke to back in Aug. 1963. Glenn Beck is a media star who often quotes historians and politicians of the past, points to historical facts and figures, and implores his viewers to know more about the best of America’s foundation and history-making events. He invites his audience to use this knowledge as inspiration to change America from the dangerous path that it is on. I concur with that general message, but I find it both paradoxical and duplicitous for a self-taught historian — whose notable CPAC speech just months ago was full of great facts, quotes and figures from America’s past — to be so ignorant of the significance of Aug. 28, much less any speech on that date from the steps of the Lincoln Memorial. It seems dishonorable that a man who has called the first black president a racist (on his television show) and mocked the president and his daughters with racist dialect (on his radio show) should lead a rally on the anniversary of the greatest civil rights speech recorded, and on the very grounds where the epic speech was given in 1963. It is dangerous to support a leader who believes that the diversity among us should not be acknowledged and addressed, even as we see the further widening of the gap between blacks and whites in America. When Sen. John McCain was calming down the incendiary anti-Obama hatred during the 2008 presidential campaign, Palin stoked the fires, refusing to address inappropriate catcalls of “boy” and other racial vitriol. Throughout his struggles and his triumph as a Nobel Peace Prize winner, he exhibited leadership and grace to unify and advance America. Palin’s actions have been choppy and biting, inconsistent and often polarizing — a trend since she burst onto the national scene in 2008. Her actions do not signify leadership, and thus, I cannot and will not co-sign her irresponsibility with my presence onstage on Saturday. Smaller government — a basic tenet of the Tea Party movement that I concur with — will never return to America without a bigger role for people, a role that is capable of touching blacks in Chicago at the same depth as whites in Kansas. Not enough of the Tea Party movement — and many would say none of the Tea Party movement at all — embraces unity outside of the friendly confines of its immediate supporters. Too many of its representatives, including most of the speakers on the stage, are incapable of winning the political middle, saving the destitute and making inclusive change. All of those things mattered to King. What we need in America is unifying leadership. President Obama promised it as a post-partisan candidate and has not yet delivered as a very partisan president. The Republicans have not shown an ability to spark that connectivity across communities even as they garner momentum for November. People such as Palin, Dr. Laura, Rush Limbaugh and Beck have rallied conservatives effectively, but not Americans collectively. I support conservatives, and I believe in the core Tea Party message. I support the good people of the movement across the nation. Yet I also know that there is an honor that must be restored through an acknowledgment of the problems that divide us, as well as the courage to heal through the differences that estrange us, especially during turbulent economic and social times. So that’s why I said no. Who was the author of this piece? Never mind, it was Lenny McCalister. 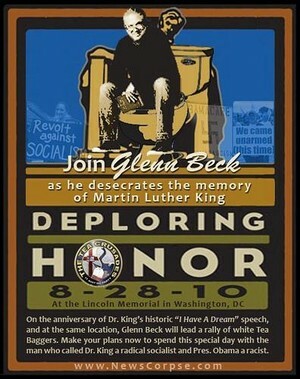 Do you find it strange that you are more focused on Glenn Beck’s event at the Lincoln Memorial where he goes to the memorial of the greatest war-time president in history to pay tribute to our military MORE than you focus upon what was done at the Al Sharpton event that was ACTUALLY billed as a tribute to King? Ironically even the union guy focuses on Palin. Where is the King legacy alive on the streets of our community? The only thing I find “strange” is you, Porch! 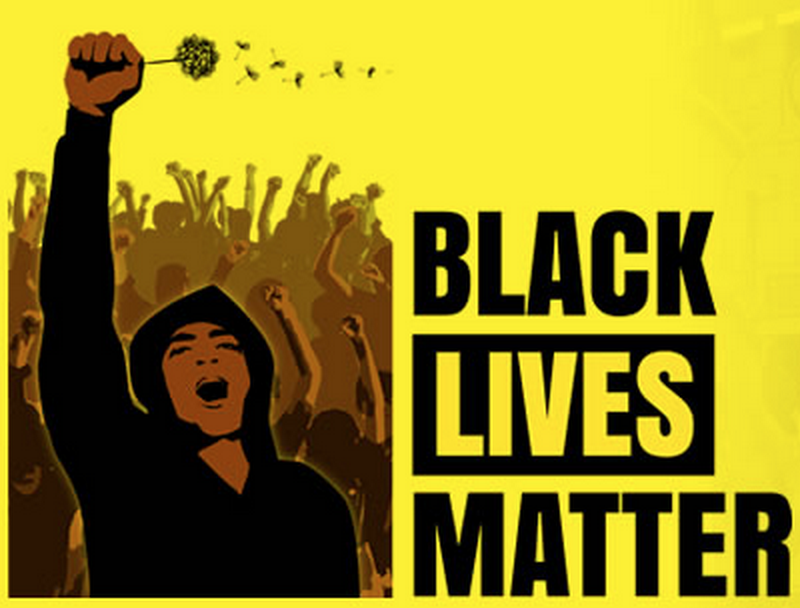 I was at the “Sharpton” event – so once again you’ve made a stupid conclusion unsupported by any facts. Beck noted that, in contrast to the liberation-theology views he ascribed to Obama, he’s a Mormon. It was one of Beck’s rare public mentions of his faith. after two years of pushing what, among white folks, get real here? I’ve been in a News wasteland for a few days, with no convenient internet access. Battening down the hatches for a visit by Earl. Not surprising that Beck is backing down – he’s getting hammered from a lot of corners. Check Tim Wise’s reaction to Beck. I’m going to be scarce on the posting side the next few weeks. I’ve got 9 major proposals going out the door in the next 2 weeks. Wages of the sin of hard work… Indeed.